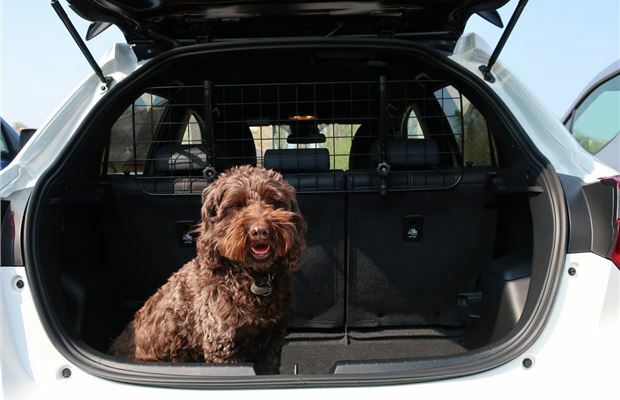 The Sakura headrest dog guard is, as the name suggests, a budget dog guard that hooks over the headrests of your car's rear seats. 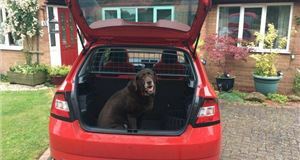 At around £30, although often discounted on Amazon, the Sakura universal dog guard is very good value for money - especially compared to pricier, car-specific dog guards like the Travall and Guardsman. But does the Sakura lack the build quality needed to prevent a dog climbing over the rear seats? 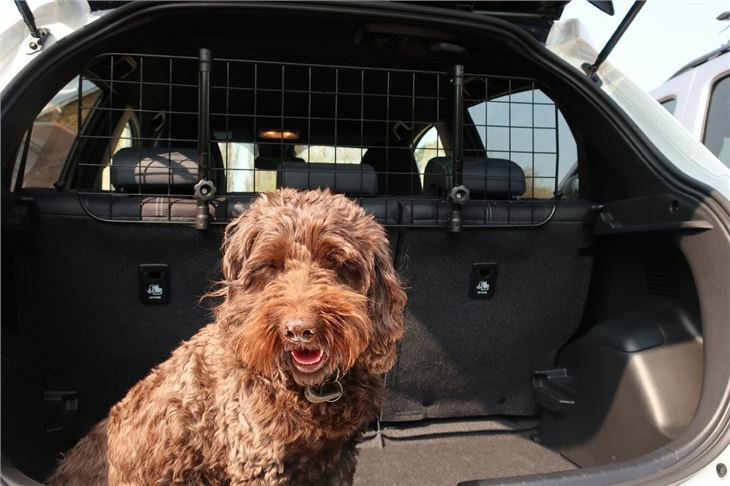 The Sakura dog guard is fairly light and far slimmer than previous dog guards we've tested. 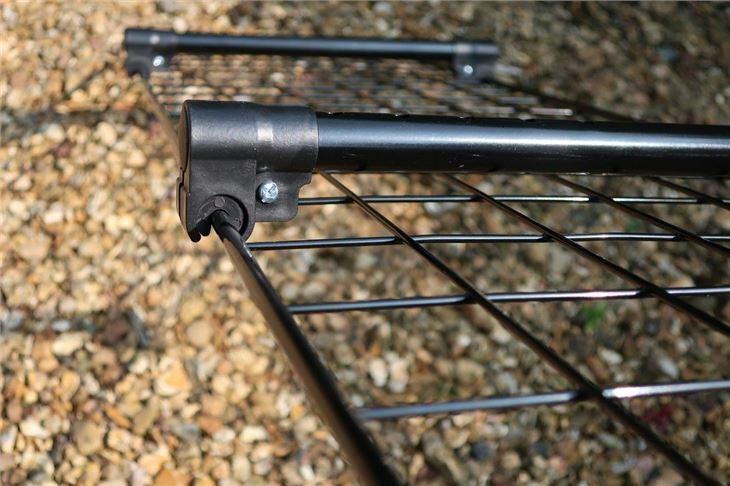 It comes unassembled in three sections; the long main dog guard and two 'wings' that clip onto the guard to extend the length in wider cars. 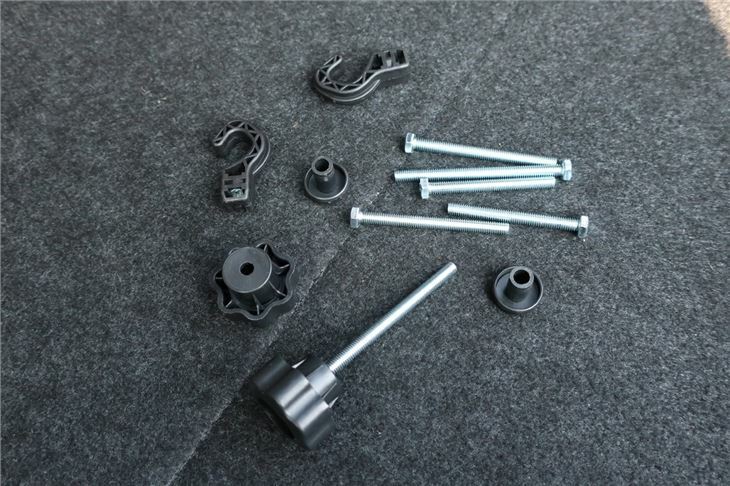 There are also two poles and two small bags of screws, screw caps, connecting clips and hooks. There are handy fitting instructions on the website which we found very helpful. 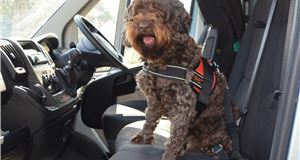 The first step is to simply line up the dog guard against the rear seat headrests to figure out where to attach the poles. The poles need to be just to the side of the metal poles of the headrest so that the hook can fit around them for attachment later on. Lining up the headrests with the guard isn't tricky, but attaching the poles is a little bit difficult - they need a hard shove to attach them properly. One that's done, it's a case of figuring out which screws you need to use. Six screws are supplied, but they come in pairs of three different lengths. We opted for the longest screws but, after attachment, these turned out to be too long. It wasn't tough to remove the guard but it's a bit of an unnecessary faff. 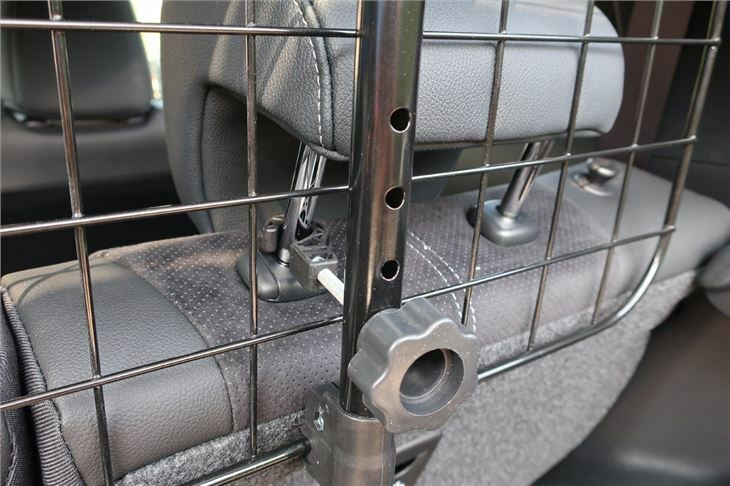 Using the medium length screws, we pushed them through the holes in the pole on the dog guard and then screwed them into the hooks around the headrests. Assembling the dog guard isn't difficult or time-consuming; it was pretty easy and took about 20 minutes in total. However, the design of the guard and the components makes putting it together harder than it needs to be in some ways. For example, build quality is reasonable for the price but the plastic hooks didn't stay hooked on the headrest when we tried to screw in the screws, so it was a matter of trying to hold the hook through the guard while also turning the screw cap - which isn't attached to the screw, so something the cap just ended up spinning but not turning the screw. However, these aren't major complaints, nor would I say they'd prevent us buying the dog guard if we were in the market for an entry-level, universal guard. Build quality of the actual guard is okay, if not a touch flimsy. 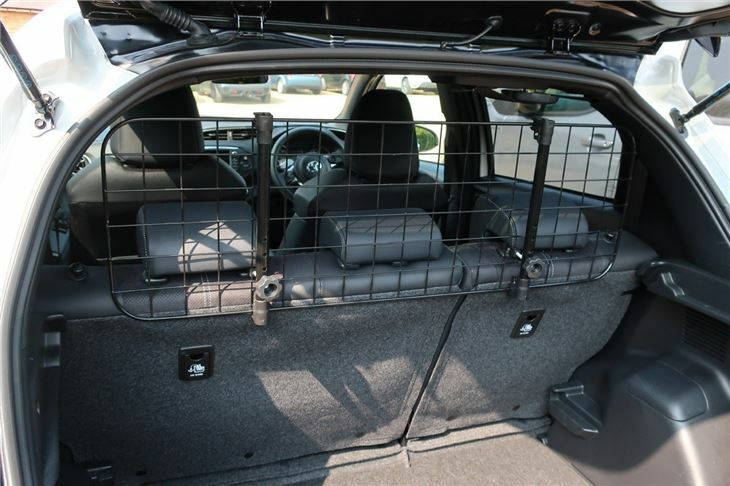 A dog wouldn't be able to get through the guard, but because it's a universal fit rather than car-specific, it'll fit different models in different ways. 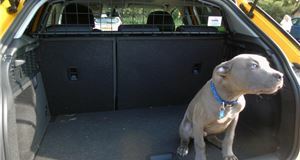 In the car we used, there's a small gap above the guard, but a dog couldn't get through there (we hope). Although, a very determined dog might be able to pull at the guard because its only points of attachment are at the bottom - meaning the top of the guard moves a bit. The instructions do tell you to tighten it as much as possible though so it doesn't move. 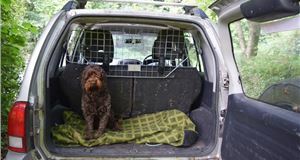 As we used a small car, there was no need for attaching the wings to extend the dog guard, but these would be attached using the connecting clips supplied. If you're looking for a universal fit, budget-friendly dog guard - the Sakura should be at the top of your list. For £18, which is the price on Amazon at the time of writing, you can't get much better than this. 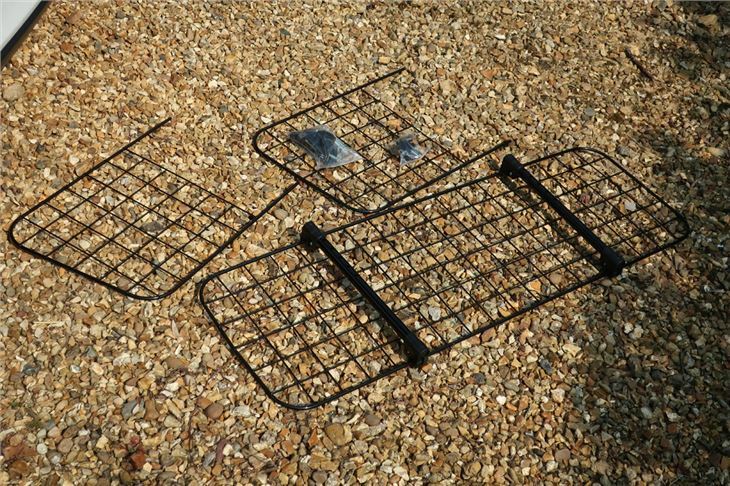 Build quality isn't amazing, and fitting has its own small annoyances, but for the most part - this dog guard is excellent value for money.